SPRINGDALE - Trisha Montague, MSN, RN, NEA-BC, senior vice president and chief administrator for Arkansas Children's Northwest, has spent her entire 30-year career working in pediatrics. 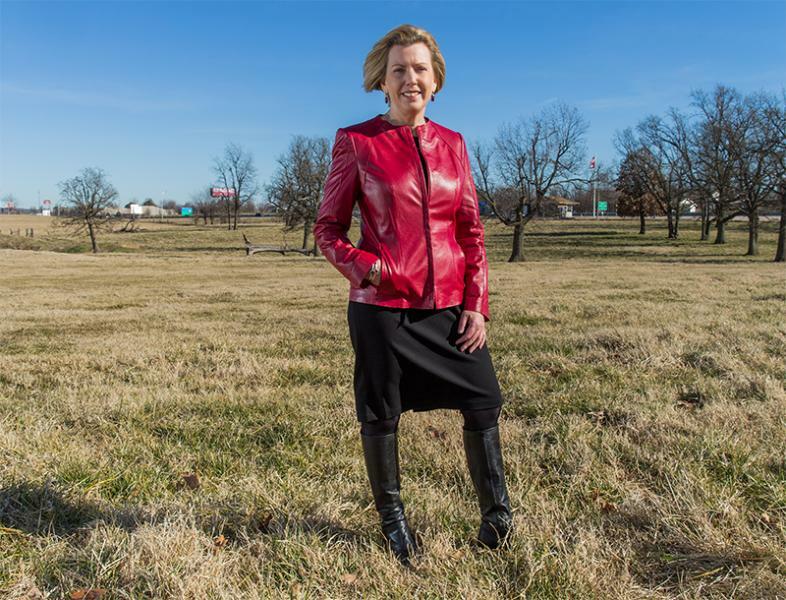 Now she is taking on her biggest job yet, overseeing the construction, staffing and operations for the new $427.7 Arkansas Children's Northwest scheduled to open in January. "It is an exciting and unique opportunity," said Montague, who moved from San Antonio, Texas, to take the job with Arkansas Children's in 2015. "I have had experience both adding on to significant projects, as well as a complete tear down and rebuild of a children's hospital on the campus of a vacant adult hospital in San Antonio. This was my last job before moving to Arkansas and was still going on when I left in 2015." Montague worked for Arkansas Children's Hospital from 1997 to 2001, so she was familiar with the organization, the mission and the passion for the hospital shown not just by employees and patients, but the people of Arkansas. "The people of this state have always been proud to call Arkansas Children's their own. When Arkansas Children's Northwest opens in January, this state will have not one but two children's hospitals," Montague said. "That's unique in a state this size. Thanks to the generous support of this community, Arkansas Children's Northwest will be able to improve the health of children by bringing pediatric specialist care close to home for the second most populated area in the state." While being brand new with all the latest technology is a plus, so is being a part of the tradition and culture of the 106-year-old Arkansas Children's. "We have the gift of standing on the shoulders of the Arkansas Children's reputation and legacy," Montague said. "The community is so engaged. This is one of the things that has struck me over and over. The level of engagement, knowledge and support is something I have never seen before. Everyone has a story to tell about someone they know who has been helped by Arkansas Children's. In addition, people are giving us amazing gifts. We are still in the middle of an active fund-raising campaign, but the generosity has been amazing thus far." One of the biggest parts of her job currently is recruiting staff. She said it is easiest to recruit someone who is already familiar with the area and its many amenities. With those who live outside the region, she finds if she can get them here to show them how sophisticated and cosmopolitan it is while offering a wealth of outdoor recreational opportunities, the conversation moves to another level. The hospital is working to bring such pediatric subspecialists to the area as emergency, cardiology, ear, nose and throat, anesthesiology and hematology/oncology. These subspecialties are under-represented in Northwest Arkansas, and will enhance the depth of pediatric care available in Northwest Arkansas. The new hospital also has built-in telemedicine abilities in order to access expert care in an instant. "It is great to start with the ability to do telehealth if needed," she said. "Technology exists now where a telemedicine specialist can use a stethoscope to do an exam of a child." Integrated electronic health records will be available on an iPad, which will also allow parents or children to order their dinner, watch a movie or play a game. And within the hospital on the inpatient floor there will be a "family house" with space for a living room, media center, dining area and kitchen. "Children's hospitals are designed to meet the needs of the entire family, not just the patient," she said. "This type of amenity allows the entire family to share a meal together when they would like." The hospital will have 24 in-patient beds, a 30-bed emergency department, an outpatient clinic with 30 exam rooms, and operating room suites with the latest technology. Arkansas Children's Northwest has been actively recruiting staff and physicians since September 2016. "It is a huge challenge," Montague said. "We're in a community that has less than a 3 percent unemployment rate. We have recruited quite a few people and have quite a few more to recruit. Our whole team does a weekly huddle just on physician recruitment. We need nurses, physical therapists, surgical technicians and child life specialists." "The great thing about becoming a nursing leader is that you are able to indirectly and directly impact a lot more patients," she said. "Once I began to understand that, I was hooked." Two things drive her management style: servant leadership and transformational leadership. "A good leader doesn't treat everyone the same," Montague said. "You need to understand what inspires the individual and adapt your style to what works for them. My leadership style is all about creating an environment for people to be the best they can be. I really believe in teamwork, and that by providing an environment of trust, empowerment and knowledge, you can create something greater than what you actually are." When Montague started out in her career, nurses rarely were tapped to lead big hospitals and health systems. She has found it rewarding to see the holistic training and organizational skills of nurses being recognized today resulting in nurses being tapped for top administrative jobs. "In my career, I'm starting to see nurses come into their own," she said. "I feel nothing but privileged to be part of it. I love what I do." Having benefitted from the assistance of major mentors along the way, she finds it rewarding to get calls for advice from people in different areas of the country where she has worked. "I have tried hard to be the kind of person people trust and ask for advice," she said. Montague and her partner love music, theater, riding bikes and walking. "We took a leap of faith moving up here," she said. "But we have been nothing but pleasantly surprised. There is a lot to do." Arkansas Children's Northwest is being built on 37 acres of land donated by Robin and Gary George, Cathy and David Evans and their families. The campus is located on I-49 between Don Tyson Parkway and Highway 412, across from Arvest Ballpark.